IBPS SO 2019 Prelims to be held from December 29, registration to start soon: The Institute of Banking Personnel Selection (IBPS) in its exam calendar mentioned that the recruitment examination for the post of Specialist Officer (SO) will start from December 29, 2018. The IBPS will release the registration notification for IBPS Specialist Officer (SO) exam 2019 soon on its official website - ibps.in. The candidates recruited through IBPS SO examination will be posted in various specialist positions such as accounts, marketing, HR, etc. The registrations for the IBPS SO exam is expected to begin from the third week of October 2018. 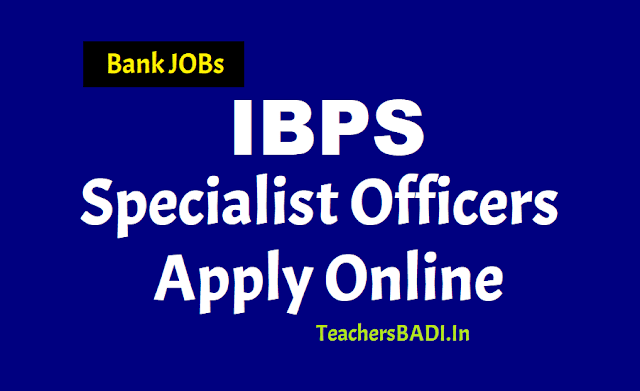 IBPS SO Recruitment 2019: Institute of Banking Personnel Selection, IBPS issued notification for Specialist Officers Cadre posts. As per the notification eligible candidate required to register for the Common Recruitment Process (CRP SPL-VIII). There are various posts including IT Officer (Scale-I), Agricultural Field Officer (Scale I), Rajbhasha Adhikari (Scale I), Law Officer (Scale I), HR/Personnel Officer (Scale I), Marketing Officer (Scale I). Interested candidate can apply online on IBPS's official website www.ibps.in. Candidates are advised to regularly keep in touch with IBPS website www.ibps.in for more details and updates. The process of Online registration and application starts from 6th November 2018 (Tentative Date). Online examination will be held in two phases, preliminary and main. Check eligibility criteria, educational qualification, age, important dates. I.T. Officer (Scale-I) 20 to 30 years 4 years Engineering/Technology Degree in Computer Science/Information Technology/Electronics/Electronics and Instrumentation. Law Officer (Scale-I) 20 to 30 years A Bachelor Degree in Law and enrolled as an advocate with Bar Council. HR / Personnel Officer (Scale-I) 20 to 30 years Graduate and two years full time post graduate degree or two years full time Post Graduate diploma in personnel Management / Industrial Relations/ HR/ HRD/ Social work / Labour Law. The online Examination will be conducted in various venues across India. Candidate who have been shortlisted in the Online Main Examination for CRP SPL-VIII will called for an Interview. Candiates are advise to visit official notification of IBPS Specialist Officer recruitment 2018 here before filing the form. Candidates can apply online only from 6th November 2018 to 26th November 2018. As per the IBPS exam calendar, the IBPS SO Preliminary Examinations 2019 will start from December 29, 2018, and the Main examination would be held on January 27, 2019. The candidates to please note that the actual date of release of the notification is not known as yet. However, as per the tentative examination dates, it can be expected that the notification would be released soon. Last year, the IBPS SO exam notification was released in the last week of October. IBPS released official notification for Specialist Officer recruitment 2018-2019. Interested candidates can apply for the posts along with the submission of application fee. The CRP involves common written examination (preliminary and main), common interview and provisional allotment. Institute of Banking Personnel Selection (IBPS) would release official notification for Common Recruitment Process (CRP) for selection of personnel in Specialist Officers' cadre posts. Online examination for the selection will be held in December 2018/ January 2018. IBPS SO recruitment will be held for selecting candidates to the posts of Scale-I Officer. The CRP involves common written examination (preliminary and main), common interview and provisional allotment. IBPS SO 2018 notification can be found at ibps.in. 20 - 30 years as on 01.11.2018. Upper age limit for unreserved category applicant is 30 years. For OBCs it has been 33 years. For the SC and ST category the age relaxation has been 35 years. Engineering/ Technology Degree in CSE/ IT/ ECE/ Electronics/ Electronics & Instrumentation/ Degree in Agriculture/ Horticulture/ Animal Husbandry/ Veterinary Science/ in relevant discipline/ Post Graduation Degree in Hindi with English/ Bachelor Degree in Law (LLB) & enrolled as an advocate with Bar Council/ Post Graduation degree/ MMS (Marketing)/ MBA (Marketing)/ PGDBA/ PGDBM/ PGPM/ PGDM with specialization in Marketing. The online examination (Preliminary and Main) for the next Common Recruitment Process (CRP) for selection of personnel in Specialist Officers' cadre in the IBPS participating organisations is tentatively scheduled to be held in December 2018 or January 2019, said the IBPS SO notification. Any eligible candidate, who aspires to join any of the IBPS Participating Organisations as one of the Specialist Officers' post, is required to register for the Common Recruitment Process. The examination will be two tier i.e. the online examination will be held in two phases, preliminary and main. Candidates who will qualify in Online Preliminary Examination and shortlisted will have to appear for Online Main Examination and shortlisted candidates in the main examination will subsequently be called for a Common Interview to be conducted by the Participating Organisations and co-ordinated by the Nodal Bank. Depending on the final vacancies to be filled in during the financial year 2018-19 based on the business needs of the Participating Organisations and as reported to IBPS, candidates shortlisted will be provisionally allotted to one of the Participating Organisations keeping in view the spirit of Govt. Guidelines on reservation policy, administrative convenience, etc. The validity for CRP SPL-VIII will automatically expire at the close of business on 31.03.2019 with or without giving any notice. Penalty for Wrong Answers: There will be penalty for wrong answers marked in the Objective Tests. For each question for which a wrong answer has been given by the candidate one fourth or 0.25 of the marks assigned to that question will be deducted as penalty to arrive at corrected score. In order to make the online application, an applicant should have a valid personal email id. IBPS may send the call-letters or any other relevant intimation on the registered email id, hence it is important that candidate provide their own email id and keep it active until the complete recruitment process is complete. Before beginning the application process, a candidate should ensure that they have a scanned copy of their recent colored photograph and signature in the required specification. Also, candidates should keep the necessary details at hand for online payment. How to apply for IBPS SO 2018? Candidates can apply online through IBPS website. Step two: Click on the CWE Specialist Officer tab. Step three: In the new window, click on the apply link. Step four: You will be redirected to the application portal where you will have to first register by providing your email id and phone number. Step five: A provisional registration number and password will be sent to the registered email id and phone number. Use this to login to the application portal. Step six: Complete the application form and make application fee payment. Step seven: After application completion, print a copy of the confirmation page for future reference. The application fee for SC/ST/PwD candidates is Rs. 100 and for all other categories is Rs. 600. The payment can be done only in the online mode through credit card, debit card, netbanking, IMPS, or through cash cards and mobile wallets. Declaration of Result of Online Main Examination: February 2019. Download of Call letters for interview: February 2019. Conduct of Interview: February 2019. Candidates require to vist IBPS's website www.ibps.in and click on the home page to open link "CRP Specialist Officers" and then click on the option "Click Here to Apply Online"for Specialist Officers (CRP-SPL-VIII) to open online Application form.